Henry Algard came to the township of Oregon with his parents in the fall of 1846. Here is where his father began farming on Government land in the openings. Henry learned blacksmithing and was the Storytown blacksmith two years prior to 1867. He was able to purchase some 202 acres, build a good barn and handsome farmhouse. He served as one of the Supervisors of Oregon for four terms. Henry and his wife Phoebe bred Durham grade cattle and merino sheep and he was associated in several retail stores. The 1870 Census only lists Henry and Phoebe, with no children. Mr. Algard built and owned the home until 1906. Henry and George Algard were said to have the first automobile in Oregon! The Henry and George Algard families are buried in Prairie Mound Cemetery. The residence at 145 West Lincoln Street is located at the western edge of the district on the north side of the street. 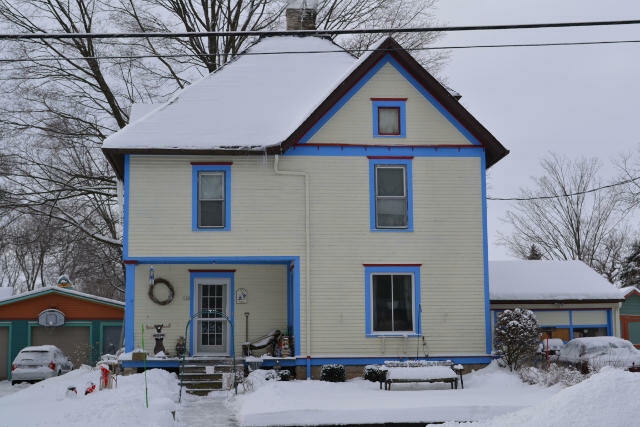 Built c. 1890, the two-story frame house rests on a cut-stone foundation and is sheathed in clapboard. The house possesses elements of the Queen Anne style, including patterned shingles, decorative brackets, and an irregular plan. Gable ends on the front and side elevations are clad in patterned shingles and display bargeboards with decorative details and are supported by ornamental brackets. Windows are predominantly one-over-one double-hung sash with wood surrounds and crowns accented with decorative scroll-cut swags. Two original fixed-frame picture windows with headers are located on the front (south) and west elevations. Shed-roof awnings supported by decorative brackets shelter each window. The historic shed-roof front porch has been enclosed and rebuilt with a concrete block foundation. A modern bay window accented with decorative brackets has been added to the porch facade. An exterior staircase, located on the west elevation, accesses a second-story entrance. A modern garage with concrete foundation has been attached to the rear. 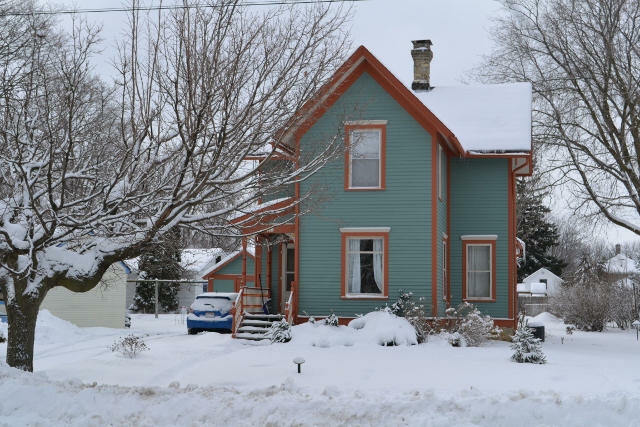 This house retains its historic form, siding material, and decorative Queen Anne details. A carriage house, c. 1890, is located at the rear of the property. According to Sanborn maps, this building was converted into a residence on a subdivided lot by 1928. Because this building no longer retains its original appearance or function, and does not contribute to the residential character of the district, it was omitted from the district boundary. Oliver Rose was a hard-working, prosperous farmer who lived in the Oak Hall area of Fitchburg (Greenfield) as early as the 1850s. In 1853, along with Salisbury, Palmer, Rose, Richardson, Pritchard, Booth, Gilbert, Wallace, Spink, Titus, Showers, Nott, Roe, Blizzard, Adams and McCune, he was one of the first to purchase space (Section 1, Lot 9) in the Oak Hall Cemetery. He was active in the Cemetery organization as late as 1871 when he served as a Sexton. The family lived in Fitchburg 58 years, retiring to the Village of Oregon. Oliver and his wife Edna had two daughters, Emeline and Lillian. The residence at 133 West Lincoln Street is oriented to the south and stands on the north side of the street. Built c. 1894, the two-story house has a truncated hip roof with a central interior brick chimney and an irregular plan. It rests on a stone foundation and exterior walls are clad in clapboard. The house possesses many elements of the Queen Anne style, including a dominant front-facing gable clad in patterned wood shingles with decorative bargeboards displaying a sunburst motif and a narrow band of dentils delineating the attic story. Queen Anne windows with colored glass panels are located on the east elevation and in the attic story of the front-facing gable. The east elevation also features a paneled bay. A second-story balcony above the bay is enclosed with a scroll-cut balustrade and sheltered by a small projecting gable supported by turned posts and accented with decorative brackets and spindlework. Windows are predominately one-over-one double-hung sash with crowns; some windows are paired. Windows on the west elevation are replacements and some of the crowns have been removed. Basement windows are three-light awning. The front porch, rebuilt with a concrete block foundation, is partially enclosed. 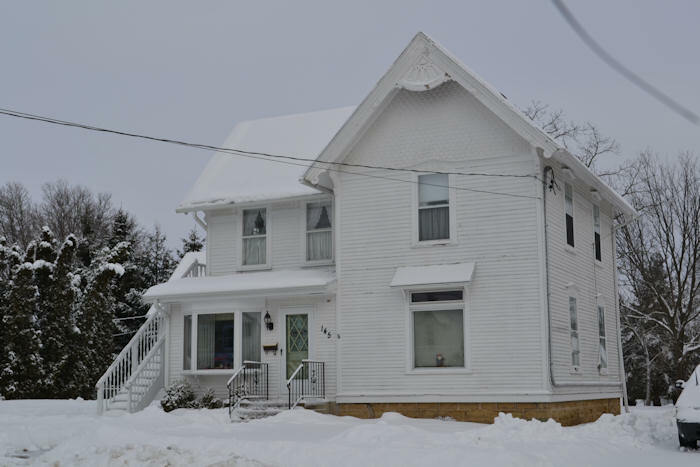 The enclosed portion features a band of modern one-over-one double hung sash windows. The open portion retains turned post support columns. A historic shed-roof side porch with turned post supports protrudes from the north end of the east elevation. A partially enclosed hip roof porch is located at the northwest elevation. A modern shed-roof addition clad in vertical siding is located on the rear. A two-bay noncontributing garage, c. 1950, is also located on the property. Oliver Palmer, a prominent figure in the early history of the Methodist Episcopal church of Oregon, came to Wisconsin in September, 1853. He owned and farmed several farms in the township of Oregon where he served as a Supervisor in 1855 and 1871. He took no active part in politics until the breaking out of the Civil War, when he became exceedingly influential in the matter of raising troops. He sold his farm in 1878 when he and his wife settled in the Village. They built and lived in one of the finest of the many pleasant homes in the Village. This Gothic Revival style residence is located at the eastern edge of the district on the north side of the street. Built c. 1879, the cross-gable brick house is one-and-one-half stories, has a central brick chimney and rests on a stone foundation. Each of the four steeply pitched gables is identical and features a triangular vent near the gable apex, decorative bargeboards, and kingposts. A flat-roof screened-in-porch with the original balustrade spans the facade. The front (south) facade has twin entrance doors, each with two panels and transoms. The front entrances are flanked by original fixed-frame picture windows with headers. Windows are predominantly replacement one-over-one double-hung sash with segmental arch lintels, stone sills, decorative hoods with protruding keystones and arched brickwork and louvered shutters. Small decorative detailing is incised into the head of each window frame, just below the lintel. Basement windows have been downsized. A flat-roof portion with a decorative cornice and replacement support posts is located on the east elevation. It shelters a two-light door with a header that is accented with a segmental arch lintel and keystone. A c. 1970 flat-roof brick addition is attached to the rear elevation. Windows on the addition are fixed on the top and awning on the bottom. A one-panel, one-light door is located on the west elevation and sliding glass patio doors on the north elevation open to a modern redwood deck. The addition does not detract from the historic integrity of the house. It is brick construction and windows are arched and similar in size to windows on the historic section of the house. The brick on all elevations has been painted white. A c. 1900 contributing horse barn with a shed roof rear addition is also located on the property. It has been converted into a garage and two overhead doors are located on the facade. Jacob “Jake” and Mary Warner came to the Township of Oregon in 1846. He worked in the old Dayton sawmill and cleared his own land in Fisher Valley. Jacob and family moved from one section to another, increasing their acreage, clearing and improving their land. Jacob succeeded, after a long struggle with poverty and sickness, and built the home in the Village in 1871, where his sons attended the Oregon schools. Mary Warner died in 1879 leaving eight children. The family is buried in the Storytown Cemetery. The residence at 126 West Lincoln Street is oriented to the north and stands on the south side of the street. Built c. 1871, the cross-gable frame house is clad in clapboard, has an interior corbelled brick chimney, and rests on a cut-stone foundation. The house reflects elements of the Queen Anne style in its overall vertical emphasis, steeply pitched roof with a dominant front-facing gable, and turned posts. First-floor windows are a combination of two-light, fixed-frame and one-over-one double-hung sash. Second-story windows are one-over-one double hung sash with aluminum storms. Most windows have louvered shutters. Simple wood crowns accent all windows and doorways. A historic shed-roof front porch located on the northeast corner has a wood balustrade, turned post supports, and decorative brackets. A modern shed roof addition clad in artificial siding is located on the southwest corner. A modern screened porch is attached to the rear elevation. These small additions do not detract from the historic integrity of the house. A single-bay garage, c. 1920, is located at the southeast corner of the property. With the exception of the rear addition and screened porch, this house is relatively unaltered. 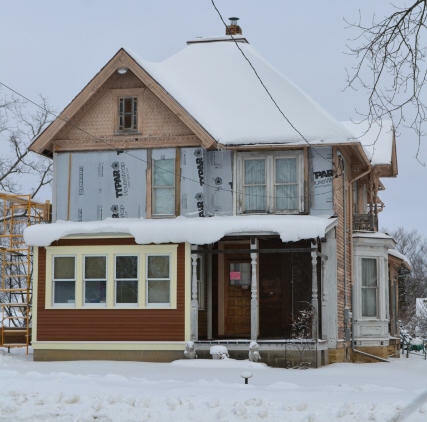 When John and Flora Gilbert built their new home at 357 North Main Street, they tore down the log shack built by John’s parents, Schuyler and Hansy Hill Gilbert. John was a farmer who retired to Oregon. 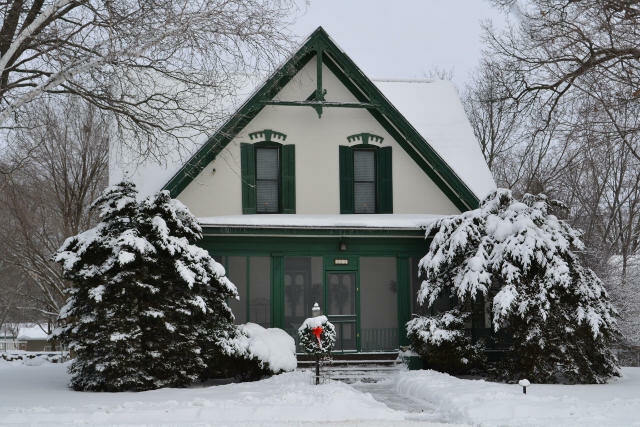 In 1870, they built the house at 116 West Lincoln for his parents. The carriage house (now the garage) was for the house on Main Street and this home on Lincoln. After the death of John and Flora, his son Henry Schuyler was willed the house on the corner of North Main and Lincoln Street (also listed on the National Register) and their daughter Cora Gilbert Fairbanks was given the house and lot located on Lincoln Street. The residence at 116 West Lincoln Street is located on the eastern edge of the district on the south side of the street. Built c. 1870, the vernacular frame house is a two-story cube and rests on a rusticated concrete block foundation. Exterior walls are sheathed in clapboard. It has a truncated hip roof with a central brick interior chimney. Gabled wall dormers are located on the front (north) facade and east elevation, and a single hip roof dormer is located on the west elevation. A wide band of trim accented with a series of small brackets delineates the second story from the attic story. The cutaway front porch at the northeast corner of the house has a simple balustrade and square wood support columns. First-floor windows are original paired wood-frame casements with smaller upper sashes. Second-story windows are one-over-one double-hung sash. Fixed windows are located in the gable ends. All windows have small crowns and wood surrounds. A modern shed-roof porch is attached to the rear elevation. A c. 1940 side gable garage is attached to the west elevation. With the exception of the garage addition, the house remains relatively unaltered. A small modern noncontributing shed is located at the rear of the property.